Birds in Tasmania: Pardalotes........40 Spots or Not ? 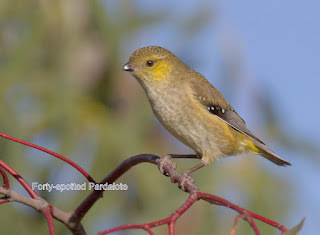 Pardalotes........40 Spots or Not ? I had taken my son and granddaughter, Jade, to Fossil Cove, near Blackman's Bay. Jade has a new found interest in fossils which needs to be encouraged, and this site was one that I thought worthy of visiting, which it proved to be. The downside was the 'climb' back up, made only slightly more bearable by the variety of birds seen--a spot for further exploration. A short drive and we stopped to explore some roadside vegetation that appeared to have possibilities. Almost immediately we noticed a pair of Spotted Pardalotes feeding in the low hanging branches of a peppermint that seemed a good photo opp., which it proved to be. I took a few shots of the female (at top), and reviewed the results on the camera's LCD screen, put the camera back up to my eye, refocused, and did a double take! In place of the 'spotted' I now had a 'Fortyspot'--a couple of shots and it was gone. We stood around looking for this bird and found that we actually had 2 pairs, and they seemed much more interested in chasing each other than in our presence, so I was able to take several more shots. If you're interested they can be found on my pbase site via the link at right. When I have been out and about birding, on many occasions I have stopped to talk to passers-by about what I'm doing, ( I have in part, found the need to explain my potentially suspicious looking gear and dress). One of the more popular bird topics raised has been about 'fortyspots', they're one of the birds that people seem to have heard of, they are after all, an iconic Tasmanian endemic species and listed as "endangered". They frequently top the list of 'must see' birds for visiting birders. On a number of occasions, the 'passer-by' volunteers that they have seen the fortyspots in their garden, or in a nearby park. Being the sceptic that I am, I usually pass over the subject of the improbability of their sighting, not wishing to offend them, but some are not easily put off. Sometime I may press them for more information, especially if they live somewhere near a known breeding site. 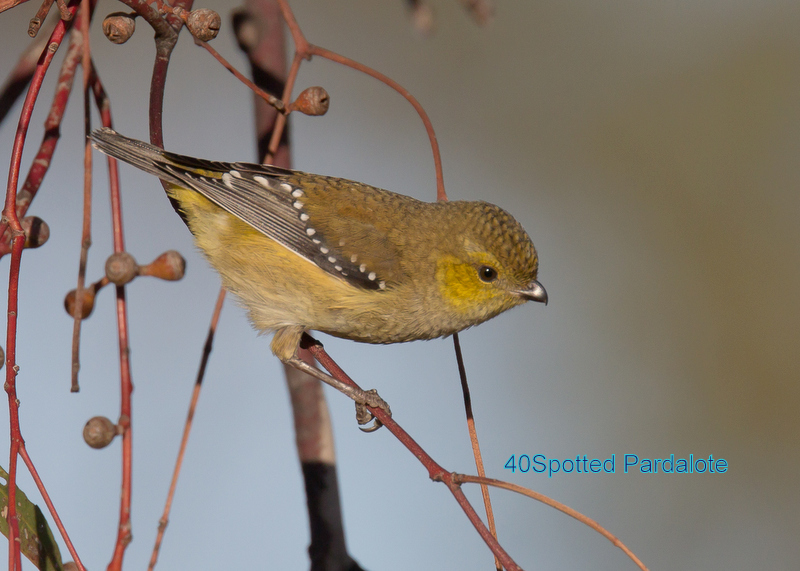 Forty-spotted Pardalotes do roam in the cooler months, but you're more likely to see the common, and much more 'flamboyantly' plumaged, Spotted Pardalote, or during the Summer, the widespread Striated Pardalote, which in any case lacks 'spots'. Undoubtedly the best place to see the fortyspots is Bruny Island, in the lightly timbered areas almost always among stands of White Gum Eucalyptus viminalis. The Peter Murrell Reserve at Kingston, which for many years was the best spot near Hobart, has become somewhat unreliable in recent times, but I understand that a few pairs still 'hang on' there. Very nice shots of a sweet little bird! loving the pardalotes! Sounds like a win-win excursion and each of you got something out of it; well done! 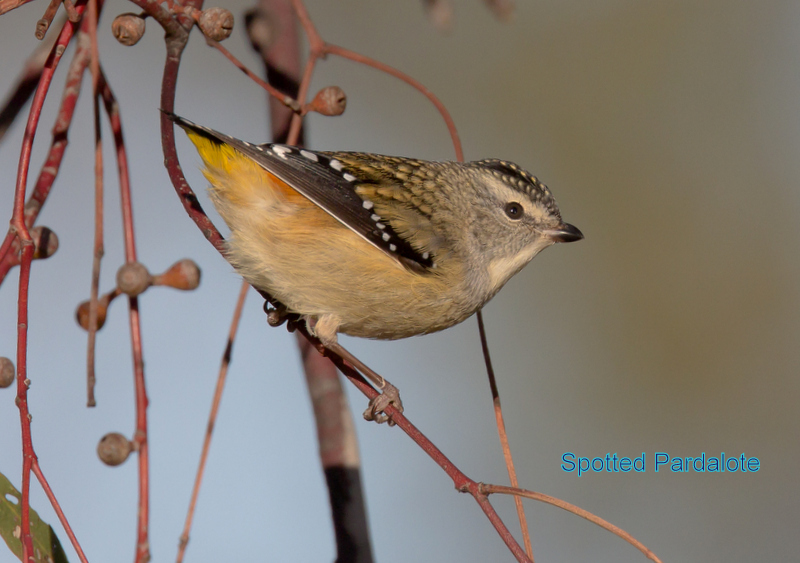 The Spotted Pardalotes were more than frequent this March and April around the university. 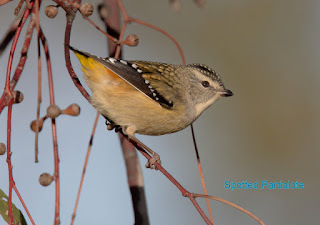 I started to bird watch last year for an assignment and haven't stopped since but that was the first time I've seen a Spotted Pardalote as it tried to fly in the computer lab. Since then, I hear and see them a lot. Does this happen? Once I successfully identify a bird by sight or call I see and hear it all the time! I agree that the two can get confused but I live close enough that I go to the Peter Murrel reserve, and fossil cove on a regular basis when I am home and the 40 spotted are definitely around both areas. I am by no means any sort of expert but I am keen enough to keep track of my local birds. The First Cuckoo of Winter?